Halberstadt Cathedral Museum, dalmatic of controversial origin. German, English or Oriental. 13th Century. Design with deer and centaurs. Photography around 1900-1940. Dalmatic, a long robe with wide but short sleeves that was worn especially in the Middle Ages in Dalmatia instead of the Roman Tunica. The so-called Blue dalmatica belonged to the coronation regalia of the German emperors. 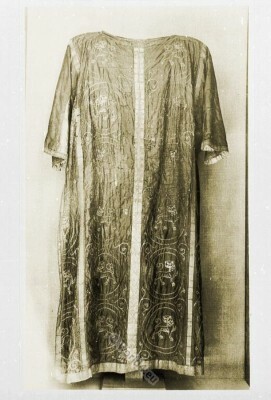 As it was Levitonarium of bishops, deacons,- the liturgical garment worn in place of the Planeta or Causa, over the alb and the stole during the Ecclesiastical Fair. This entry was posted in 13th Century, Ecclesiastical, Germany, Middle Ages and tagged Ecclesiastical Dress, Gothic costumes, Medieval costume, Monastic clothing, Tunic on 7/8/13 by world4. German Liturgical costume. Albe 13th century. The albe (from Latin alba: the white) is a product derived from the ancient tunic, ankle-length gown of white or natural linen today. With reference to the old church and its tradition alb symbolizes the baptismal garment. Traditionally worn by Catholic priests as liturgical undergarment under the chasuble, alb is regarded today as the basic garment of all those who play a role in the worship service or provide a particular service, eg, readers, communion assistants. Cologne, Schnütgen Museum. Albe, South Germany, 13th Century. This entry was posted in 13th Century, Ecclesiastical, Germany, Middle Ages and tagged Ecclesiastical Dress, Gothic costumes, Medieval costume, Tunic on 7/8/13 by world4. 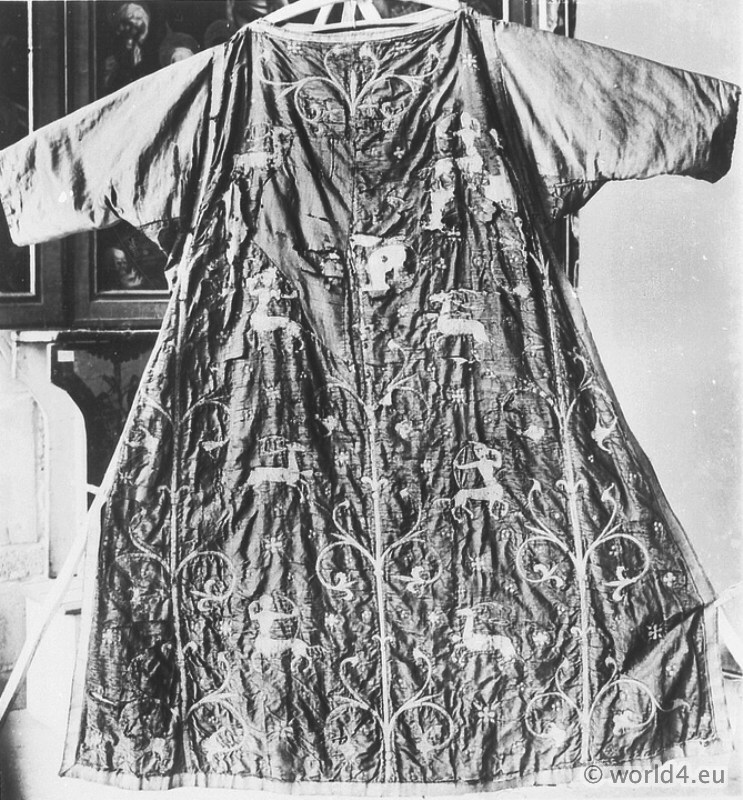 Medieval Persian Tunic. Leonata. 12th Century. This entry was posted in 12th Century, Asia, Ecclesiastical, Middle Ages, Middle East, Persia and tagged Ancient persian clothing, Ecclesiastical Dress, Medieval costume, Tunic on 6/27/13 by world4. Fashion German nobility 14tes century, Middle Ages costumes, Gothic period costumes. 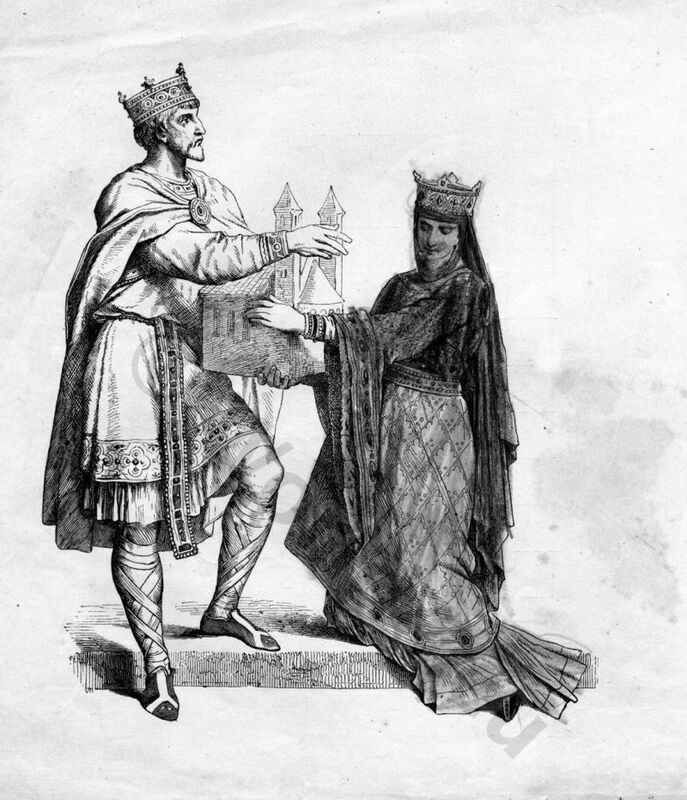 The clothing of the 12th and 13 Century emphasized the shape of the body, which was wrapped with care since ancient times. The Vertical accented human Shiloette. As in architecture, gothic, painting or sculpture It is the time in the establishment of the great cathedral at Reims and Cologne, the days of knights and courtly love, L’Amour courtois, secretly welcomed the languishing knight Feignaire, the troubadours. 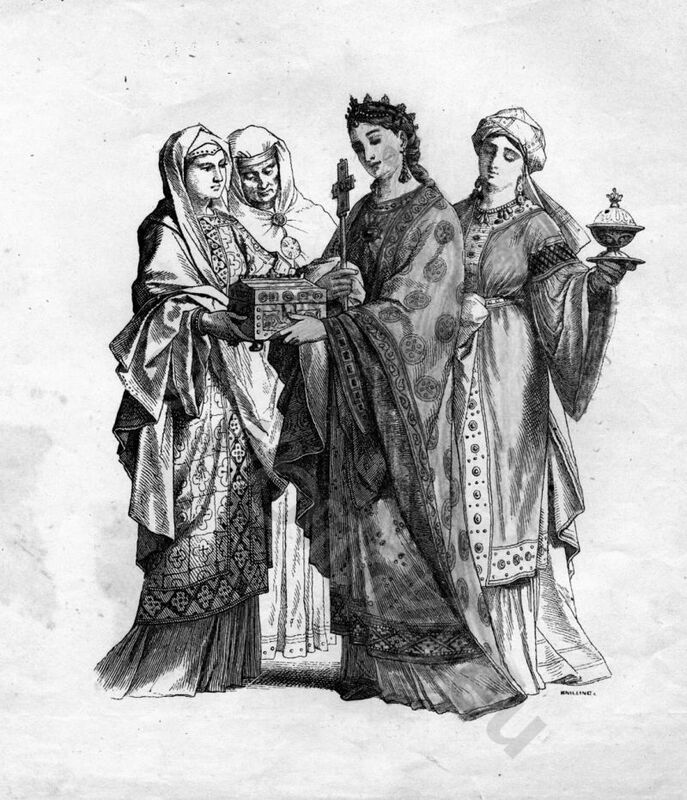 The profound influence of women on habits and fashions, starting from southwestern Europe, the courts of Spain, southern France Aquitaine caused a feminization in the manners of men. They ran her hair grow that was sometimes even decorated with flowers, wearing curls and shaved her face smooth. 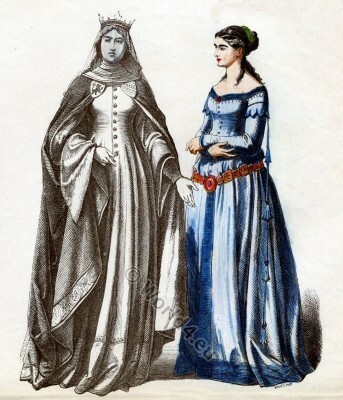 In the present illustration, a drawing from the period around 1870, published in Munich as illustrated fashion images, the well-known artists of the time participated (Wilhelm Busch) the clothing of a German princess and her maid of honor is shown. The full dress was called the robe. 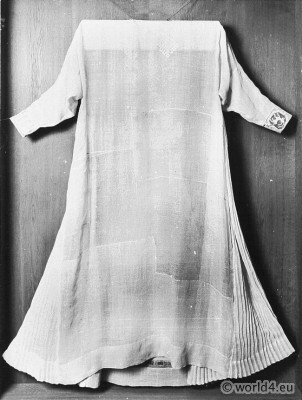 The princess wears a one-piece, front buttoned dress Cotehardie called, with long tight sleeves and wide neckline (front and rear). Buttons presented at that time a novelty, instead of the lateral lacing allowed a figure-hugging dresses section. Previously buttons were mostly used as decorative elements. The hem of the dress is decorated with embroidery. Furthermore, she wears a Nusch mantle (cape-like coat in the 14th and 15th centuries, which was held together in front with a “Nusche” barrette or brooch kind of a safety pin). Of semi-circular section of the decorated side with two brooches and depict the coat of arms of the royal house The lining of the jacket of the casing is held in the contrasting color. The fabric is made of heavy brocade that is intricately embroidered at the edges. Her head is covered by a veil on the crown sits. The lady wears the tight dress with wide neckline, has a point lying on the waist belt of the only decorative. Her dress is adorned with Zaddeln. 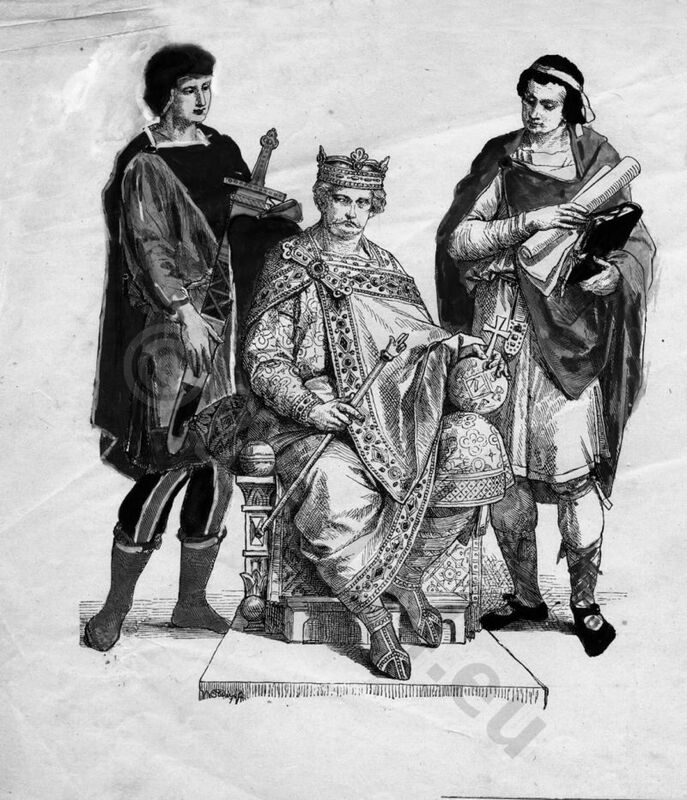 This entry was posted in 1350, 14th Century, Court dress, Germany, Hairstyle, Headdresses, Middle Ages and tagged Cotehardie, Gothic costumes, Tunic on 3/25/13 by world4. 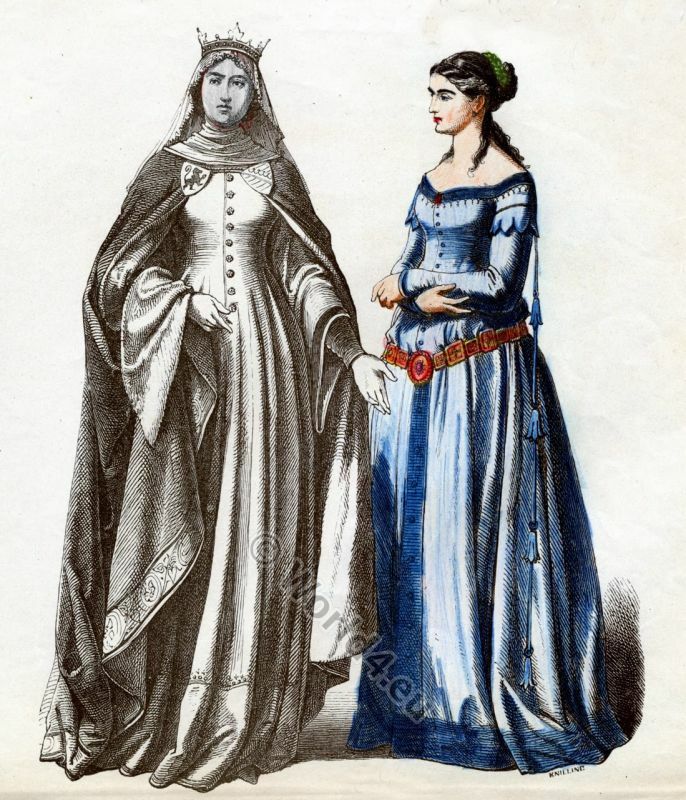 Medieval clothing 900 A.C. Frankish Noblewomen and Queen. This entry was posted in 10th Century, Byzantine, Carolingian, Court dress, Fashion History, Germany, Middle Ages, Nobility and tagged Byzantine fashion era, Medieval costume, Tunic on 3/19/13 by world4.